Announcements, recognitions, and district issues that affect the voting and tax paying public—if you need to know about it, we’ll have it here. A $1500 scholarship is available to one Powell High School graduate for their sophomore, junior, senior, or post-graduate year in college. We are now accepting applications. For more information, please read our Powell Schools Foundation Scholarship flyer. We want you to know the great things happening in our school district. Please visit this page regularly for the latest newsletters and information. Park County School District #1 is being held accountable by two new state and federal accountability acts. State accountability is defined in the Wyoming Accountability in Education Act (WAEA). This law takes into account measures specifically related to educational goals in Wyoming. Federal accountability is defined in the Every Student Succeeds Act (ESSA). Under ESSA, each state submits its own plan in regard to achievement and graduation rate goals for schools, measures for how well schools are doing, and priorities for the use of federal funds. A variety of indicators determine school performance levels and are calculated to help determine which schools are doing well and which schools are in need of support. WAEA looks at student growth, readiness, achievement, equity, and English language proficiency. Under ESSA, schools with a graduation rate below 67% and the bottom 5% of Title I schools will be identified for state-led support. Additionally, schools with a specific student group in the bottom 10% will be identified for supports and interventions led by the local school and district. Park #1 has performed very well under these new accountability expectations. For more information on how our district and individual schools are performing, we invite you to view our report card information. We want you to know the great things happening in our school district. Check back regularly for the latest newsletters and information. 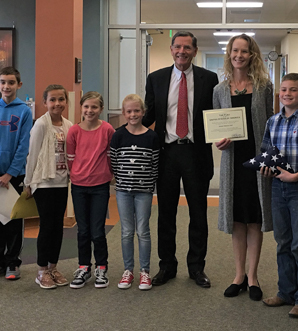 Senator John Barrasso proudly presented the National Blue Ribbon Award to Westside student council members, Principal Angela Woyak, & Superintendent Jay Curtis.